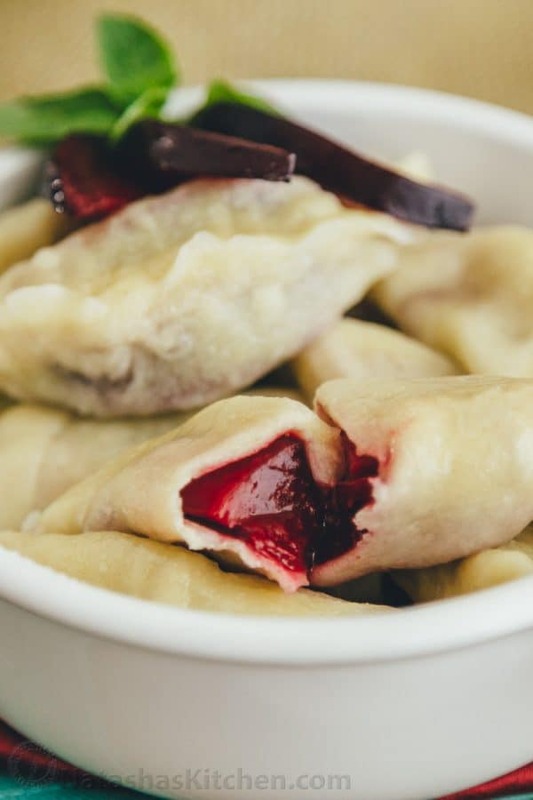 I’ve been meaning to make vareniki with plums for a long, long, long, long time. 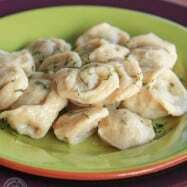 I halved my recipe for pelmeni dough. Why? (1) It’s blazing hot outside and I didn’t want to spend half the day making these. (2) I suspect hot days make me lazy. (3) I wanted to go shopping ;). Admittedly my pierogi are, well, ugly and at times a little frumpy, but they sure taste good. Plum vareniki are quite a treat; sweet inside and out. This was my favorite food growing up and it always brings back sweet memories. 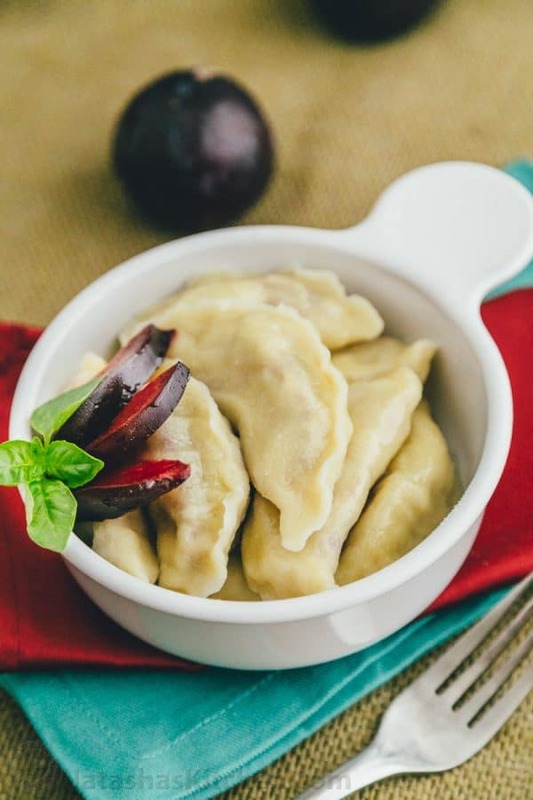 My mom always made the best plum vareniki and this recipe is hers. 1. 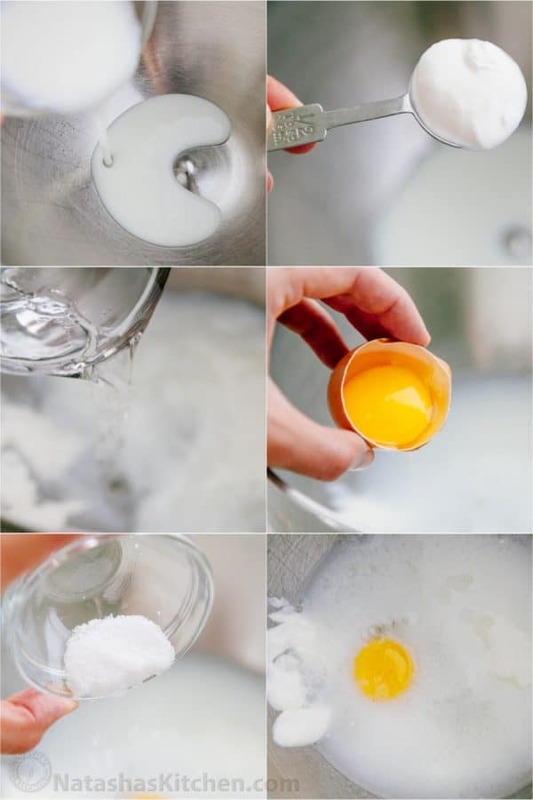 In the bowl of an electric mixer, whisk together 1/3 cup buttermilk, 1/2 Tbsp sour cream, 1 cup warm water, 1 large egg, and 1 tsp salt, just until well blended. Note: you could do all of this by hand, but who would want to? 2. Using the dough hook attachment, add in 2 cups flour and mix on speed 2 until well incorporated. 3. Add in your remaining 1 1/2 cups flour, half a cup at a time, allowing each addition to become well incorporated before adding more. Allow the dough to mix for 15 minutes, then add more flour 1 Tbsp at a time until your dough no longer sticks to the sides of the bowl. Continue mixing another 5 minutes. Total mixing time from the time you first add flour is 20-25 min. (You could use this time to learn a new hobby, check your facebook page or be productive and slice your plums ;)). Your dough will be elastic and feel sticky, but won’t stick to your fingers. 4. 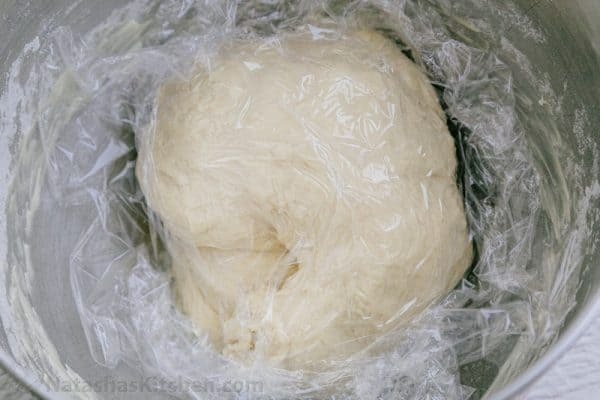 Cover dough with plastic wrap until ready to use. 5. 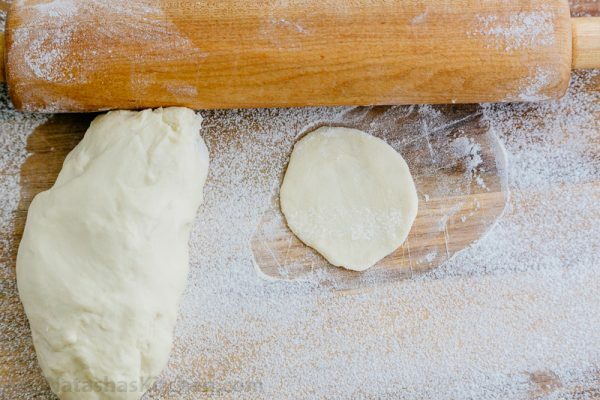 Cut off about a gum ball of dough at a time and roll into a flat 3-inch circle sprinkling with flour as needed to keep the dough from sticking to your work surface or the rolling pin. 6. Place two slices of your plum over half of your dough, being careful not to get plum juice on the edges of the dough or it won’t stick together. Pour 1/2 tsp sugar over your plums (use more or less depending on how sweet/tart your fruit is). Bring the two sides together and pinch tightly to seal the edges. Transfer to a well-floured cutting board. 7. Bring 4 quarts of water to a boil and add 3/4 Tbsp salt. 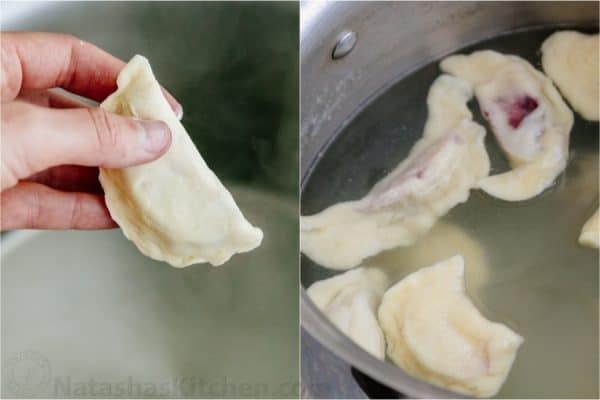 Carefully place finished pierogi in boiling water. Add them in batches (maybe 1/4 at a time). Wait for them to float back too the top and then give them another minute to cook. Pull them out with a slotted spoon and drain well. Drizzle sugar in between layers of cooked pierogi to keep them from sticking to each other. The sugar will melt over the hot pierogies and turn into a light syrup. Serve with sour cream or eat them as is. 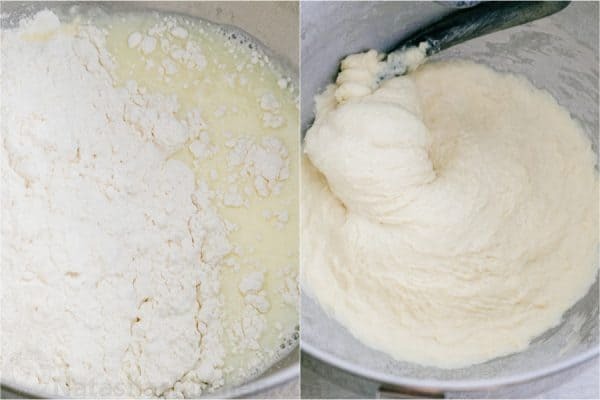 In the bowl of an electric mixer, whisk together 1/3 cup buttermilk, 1/2 Tbsp sour cream, 1 cup warm water, 1 large egg, and 1 tsp salt, just until well blended. Using the dough hook attachement, add in 2 cups flour and mix on speed 2 until well incorporated. Add in the rest of your remaining 1 1/2 cups of flour, half a cup at a time, allowing each addition to become well incorporated before adding more. 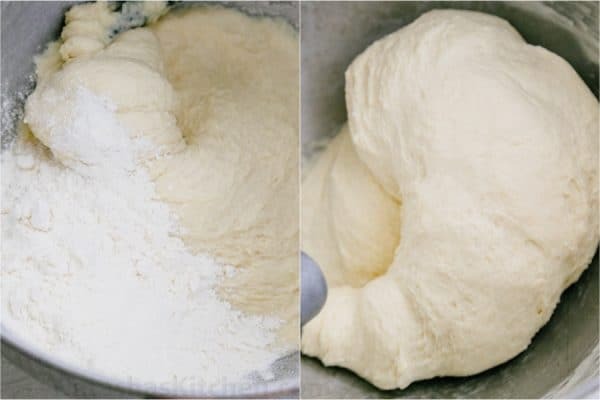 Allow the dough to mix for 15 minutes, then add more flour 1 Tbsp at a time until your dough no longer sticks to the sides of the bowl. Continue mixing another 5 minutes. Total mixing time from the time you first add flour is 20-25 min. Your dough will be elastic and feel sticky, but won't stick to your fingers. Cover dough with plastic wrap until ready to use. 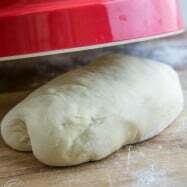 Cut off about a gumball of dough at a time and roll into a flat 3-inch circle sprinkling with flour as needed to keep the dough from sticking to your work surface or the rolling pin. 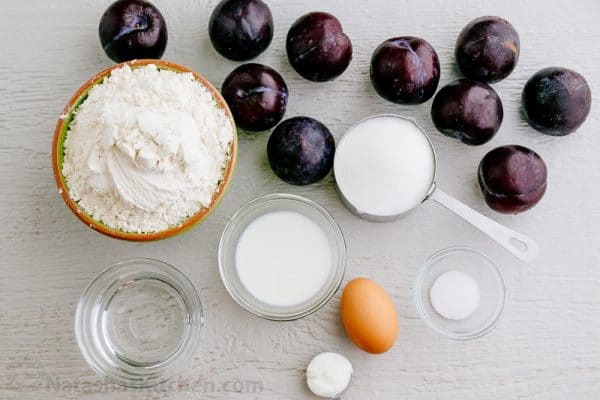 Place two slices of your plum over half of your dough, being careful not to get plum juice on the edges of the dough or it won't stick together. 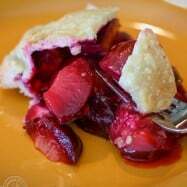 Pour 1/2 tsp sugar over your plums (use more or less depending on how sweet/tart your fruit is). Bring the two sides together and pinch tightly to seal the edges. Transfer to a well-floured cutting board. Bring 4 quarts of water to a boil and add 3/4 Tbsp salt. Carefully place finished pierogies in boiling water. Add them in batches (maybe 1/4 at a time). Wait for them to float back too the top and then give them another minute to cook. Pull them out with a slotted spoon and drain well. Drizzle sugar in between layers of cooked pierogies to keep them from sticking to each other. The sugar will melt over the hot pierogies and turn into a light syrup. Serve with sour cream or eat them as is. 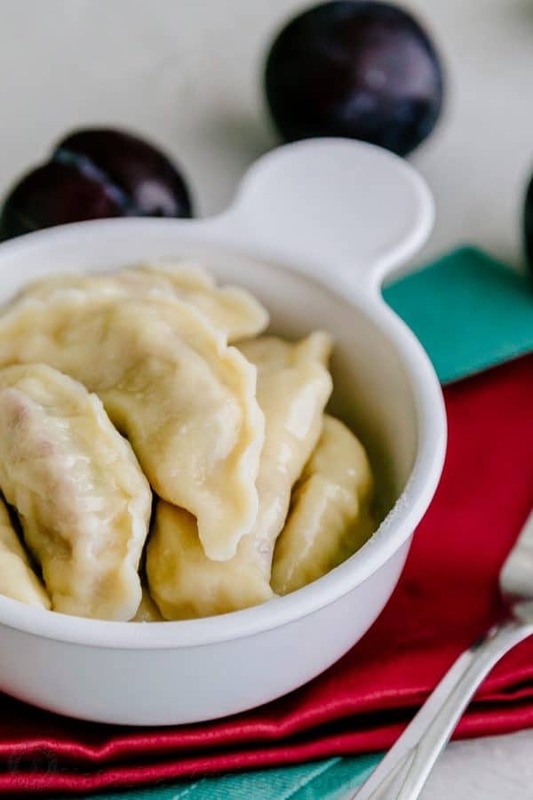 What’s YOUR favorite vareniki filling? Hello. Thank you for the recipe; I was going to make this for my 87 year old mother, who remembers her grandmother making the cherry version. Do you mean add the three and a half cups, one half-cup at a a time, mix for 15 minutes, then add the remaining 3 tablespoons? If so, do you add only enough of the 3 tablespoons so it doesn’t stick to the sides anymore? 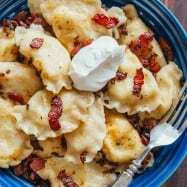 Hi, my heritage is Romanian/Polish/Ukranian and I’ve eaten perogi all my life. 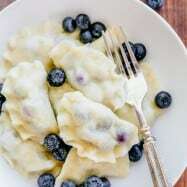 Although I’ve come across a couple of different dough recipes for boiled perogi usually the dough receipe I use is simply 2 C flour, (up to) 1 C water, salt to taste (maybe 1/2 tsp? ), and either 1 beaten egg OR 1 sloppy TBSP of oil (son had allergies). I make a well in the flour, sprinkle in salt, and add not quite the whole 1 C of water (I save and cool the boiled potato water to use AND I add in either the egg or the oil to make up total liquid). With the liquids in the flour well, I beat just until it all comes together and forms a ball (you should be able to rub your hands together and have dough come away cleanly from hands). You’re supposed to cover with a damp towel for about 20 minutes but I’ve rolled out the dought right away and didn’t notice any huge difference. I quarter the dough and roll out thin enough to see through (about 1/8″). I usuallly use a glass dipped in flour and cut rounds out of the rolled out dough, then fill each round. Good luck and enjoy! Hi! One of my roommates was from Russia and we were comparing food. He told me about the pelmeni. A friend of mine called them verenekie (phonetic spelling) and always talked about all the butter. I didn’t know you had fruit versions. My parents are Hungarian and we ate lots of Hungarian food. One of our favourites was very similar – called gomboc. We made dough from left-over mashed potatoes adding an egg and some flour. We filled them with a thick plum jam or now I fill with a pitted prune. We served then with breadcrumbs browned in butter and sugar. Our dumplings looked different too — we cut a square and put fruit in middle and then brough all the corners up and pinched the dough closed. I also made then with a sweeted ricotta filling which was excellent too. found this recipe a few months ago. 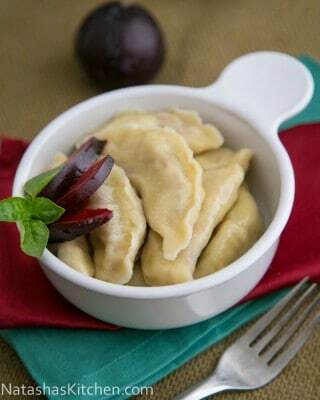 my Ciocia Genny made plum pierogies all the time. she had plum trees bordering her back yard. damson plums and one Italian plum tree. when they were ripe they were used fresh for pies, pierogies, and on breakfast kasha (buckwheat groats). she also canned them and made jam. at Wiglia she made the plum pierogies. we poured melted butter with cinnamom over them. your dough recipe is different than the one i use. 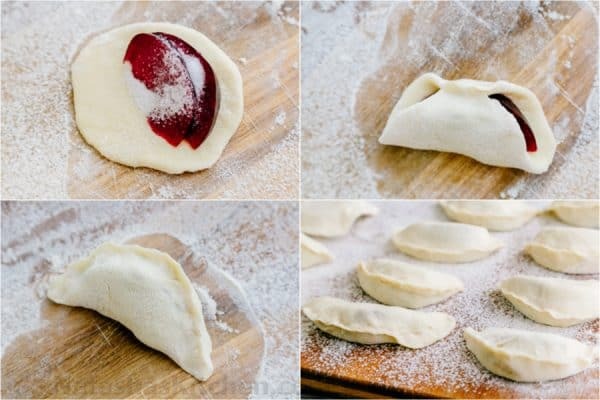 so i decided to try your dough recipe to make plum pierogies. i want to thank you for posting this because they were delightful!!! this was a great dough recipe. i also made them with apples and blueberries. I should look for a Mexican store in Vancouver too. :) Just tried it on my recent vacation to Mexico. Loved the cottage cheese too!